This is a master class made up of both our upper and lower Muscle energy technique DVDS. 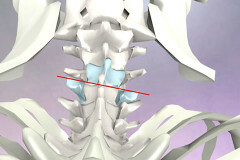 MET is one of the most effective and gentle manual techniques for the correction of somatic dysfunction. MET uses accurate assessment techniques to discover if a joint is stuck out of alignment. Then the practitioner positions the patient and asks for gentle resistance in such a way that the joint is brought back into alignment, and the tight muscle relaxed. A muscle energy practitioner gets amazing results with very little effort, and it is very easily integrated into other treatment types. This lesson is the introduction to Muscle energy technique. In this lesson Tom describes the anatomical basis for MET, including muscle spindle cell, joint mechanics and muscle function. Tom also describes the difference between MET to release a muscle, and MET to release a joint (both of which are covered in this class). Finally Tom discusses how much pressure to use, and contraindications for the work. This lesson demonstrates how to release all the muscles that surround and support the pelvis. This includes the gluteus medius and minimus, obturators, gemelli, quadratus femoris, tensor fascia latae, rectus femoris, adductors, psoas and iliacus and more. Using muscle energy technique to release the muscles is incredible efficient and effective. This lesson shows the anatomy and movement of the ilium, ischium and pubic bones (as the pelvis). 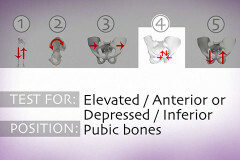 Tom shows a full evaluation for each bone, including ilium upslip, downslide, inflair, outflair, and rotation, and inferior or superior pubis. For each assessment, he shows how to bring the structure into balance, as well as the proper treatment order. This lesson shows how to evaluate the sacrum in terms of flexion, extension and rotation. 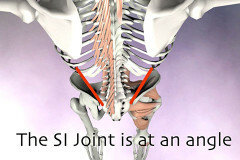 The axis of rotation is discussed, and the biomechanics of the SI joint. Then Tom demonstrates techniques to align the sacrum. This lesson shows the movement of the thoracic vertebrae and how to perform evaluation in the seated and laying position. This evaluation uses motion to discover if the vertebrae is stuck in flexion or extension on the right or left. Then he demonstrates techniques to free the restriction and get the vertebrae functioning properly. This lesson discusses the anatomy and movement patterns of the lumbar spine. Tom shows how to evaluate each lumbar vertebrae and determine if it is stuck in flexion or extension on the right or left. Then he demonstrates how to return the vertebrae to proper movement using muscle energy techniques. In this lesson Tom shows both muscle MET and articular MET. First he shows how to release all the muscles in the cervical area and shoulder, including the pectoralis major, lattisimus dorsi, trapezius, levator scapula and others. 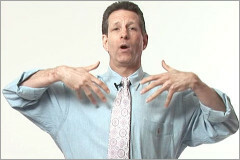 He then shows how to evaluate the sterno-clavicular joint for dysfunction, then the gleno-humeral joint itself. Finally he shows to evaluate the cervical vertebrae for dysfunction, and demonstrates how to get the vertebrae moving properly. This this lesson Tom demonstrates how to evaluate the rib cage. This includes evaluation for inflair, bucket handle, and pump handle motion. Once the general evaluation is complete, he shows to to assess each rib to determine if the rib is stuck in inspiration or expiration. 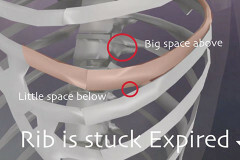 Once this is determined, he shows how to release the rib to restore proper function. 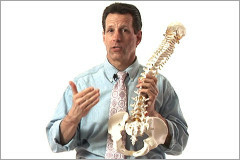 In this short lesson, Tom talks specifically about belly breathing as opposed to correct functional breathing that uses the rib cage and keeps the ribs healthy and moving.